Retirement/IRA/Roth/401k Are you still riding the bull… ready to get off? Social Security EducationWhich strategy is best for you? Annuities More important today than ever…and why. Life InsuranceWhat is the IRS NOT telling you about life insurance? Senior HealthcareGet educated before you make a choice. We are committed to providing insurance and financial knowledge, through quality products and services, to meet the financial needs of our clients. 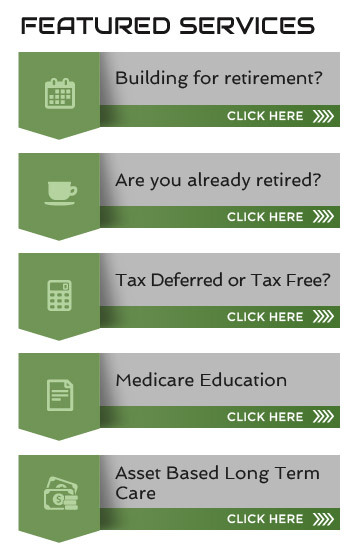 Our daily focus is targeted on educating those who are planning for their future retirements as well as those who are currently in retirement. We always seek and use steady accounts with predictable and reliable performance, to help our clients achieve their financial independence over time ......NOT OVERNIGHT. Many Baby Boomers today are envisioning retirement differently from previous generations because they have the energy and the desire to pursue other avenues as an extension of their career. Boomers may reinvent their careers or even focus on philanthropic ventures. The one common denominator is their interest in making wise investment choices with their life savings. You will use different financial tools in the protection and income phase of your life, than you used during the accumulation phase of your life.....DO YOU KNOW WHAT TOOLS TO USE IN YOUR "NEXT PHASE"? Some advisors say that Social Security and Medicare are not their job … That is not us! We embrace all areas of retirement, to help our clients embark on a smooth and more financially secure retirement. Traditional advisors pride themselves on the investment returns they are able to get for their clients. But investment returns pale in comparison to the tens maybe hundreds of thousands of dollars saved or received over a clients lifetime as a result of making smart Social Security and Medicare decisions. Treating you as we would a member of our own family. the financial world over the years, but our dedication to your financial future certainly hasn't. Providing retirement and financial planning in Charlotte, Hickory, Concord, Greensboro, Rock Hill, Salisbury, Gastonia, Spartanburg, Greenville and Asheville, North & South Carolina.